SUWON, Gyeonggi Province -- On the second floor of the R4 building on the Samsung Digital City campus in Suwon, Gyeonggi Province, a room is filled with prototypes of micro light-emitting diode displays set for market release in the coming months. The lineup of exhibited prototypes includes The Wall, first unveiled at the 2018 Consumer Electronics Show in January, which is the next generation of smart displays using micro LED technology. Micro LED displays consist of arrays of microscopic LEDs forming individual pixel elements. The South Korean premium TV maker is almost ready for mass production of The Wall displays -- for both commercial and home entertainment use -- slated for September, targeting hotels, shops, stadiums, museums, convention centers and luxury mansions. “We have completed the micro LED technology and are in a stage to raise production yields,” said Han Jong-hee, president of Samsung’s visual display business during a press conference Friday. Along with its flagship QLED TV brand, short for quantum-dot light-emitting diode, Samsung is introducing the new micro LED brand The Wall for the premium large-size market. In addition, Samsung wants The Wall to be called a display or screen -- and not a TV. By adopting the bezel-less modular type, The Wall will not come in fixed sizes and inches as other TVs. The size of The Wall can be personally adjusted by consumers to fit their space by selecting the number of display pieces they want to attach onto a wall in any shape. The upcoming household version of The Wall will be as thin as 30 millimeters or less, Han said, calling it “luxury” for home entertainment. 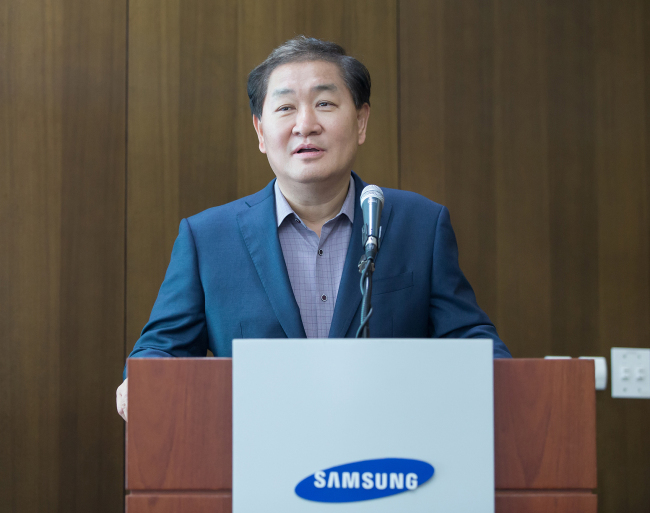 “Samsung’s micro LED displays will be totally different from previous LED products, because they will use an advanced flip-chip bonding technology proprietarily owned by the company,” said Yoo Ho-sun, vice president of Samsung’s visual display business. 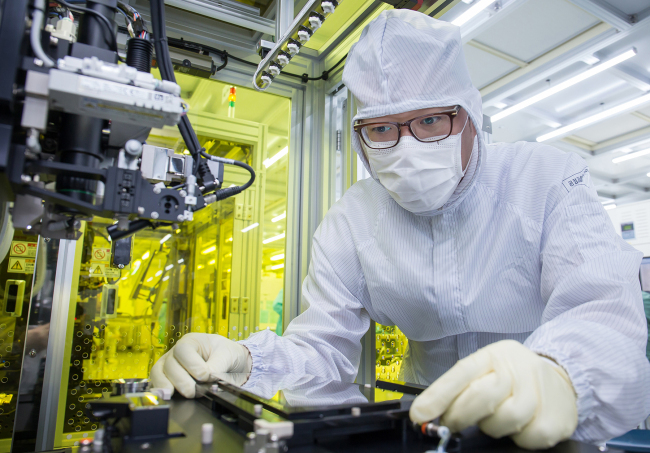 It is a method for interconnecting semiconductor devices such as integrated circuit chips to external circuitry with solder bumps that have deposited onto chip pads. In addition to the chip manufacturing process, ultra-low reflection black technology, new color enhancing LED chip technology and advanced shock-resistance technology will be applied to upcoming micro LED displays for incomparable blacks and color contrasts, Yoo said. “For a 4K micro LED TV, a total of 24 million LEDs are needed, and a total of 100 million for four such TVs,” he added. Owing to Samsung’s innovative chip structuring technology, micro LED displays will have lifespans of around 100,000 hours, outdoing their rival organic light-emitting diode displays, according to the Samsung official.